Me vs. Gravity – Renee Robbins. Writes. So I got on the scale the other day, after a month hiatus. That was the scream you heard. Turns out the “You’re Not the Boss of Me” approach to meal planning isn’t the solution that I had hoped it would be. Afterwards, I went to the park for a little cardio. This is not a new regimen, I run at least four times a week. Today I added to the intensity by running up a hill (the Kate Bush version, not that stupid Placebo cover), several times until the noises I was making started to attract lovesick deer. There are no deer in that park. Then I came home and dramatically threw myself down next to my sleeping husband, and said “Why didn’t you tell me I was getting fat?” because it fascinates me to watch his soul begin to wither and die as he tries to think of a way to answer questions like that. Anyway. Where was I? Yes. I do not like this woman that the scale morphs me into. Ten pounds, and my confidence is shot. And I am not a skinny girl! But the mean kid in my head is on a rampage. I’ve liked myself better, these last few months. I quit smoking, I started writing, I have done things outside of my comfort zone. I’ve made peace with some history. I am so disappointed that a small uptick in the amount of space I inhabit has sent me reeling into brutal self-talk. So yeah, I’m mad at myself for not liking me. I excel at hilariously vicious self-deprecation. I will make you laugh at me even when you love me and hate what I just said. And if you already don’t like me? I just gave you ammunition. When you deride yourself, you open the door for others to jump on that bandwagon, and I have enough passive-aggressive, non-supportive people in my life without adding myself to the mix. It’s a number on a scale. It doesn’t define you, any more than a blouse or a pair of shoes or a car. And while it can be considered as one aspect of what combination of you vs. gravitational pull suits you – you are so much more than a number between your beautiful toes. Enough people will go out of their way to beat you down without you inviting them in and serving them hors d’oeuvres. And that’s all I got, today. Be kind to yourselves. I have really struggled with this one myself lately. I found a picture of me from last summer, tan and thinner, and I hated myself immediately for putting on weight that I just dont’ have the motivation to lose coupled with the fact that I just love to eat. I’ve kinda made peace with it and am trying to make better choices but I still have days. I just want to feel comfortable in my clothes and I’m not at the moment. But I will be. I’m not going to obsess over the number. doesn’t give you useful information. I really struggle with the vicious self talk. It’s a hard habit to break. It took a lot to get me out of the several times a day weighing, but it IS better this way. I think. Because at any one time it’s only a snapshot, and weight isn’t as …I want to say ‘important’ but that’s not the word…pertinent (maybe?) as shape, anyway. Well I think that’s a great plan. 🙂 I find I reach a poor very quickly where I weigh all the time and cry when I don’t lose, and I’m tired of it. I decided it made me boring to obsess, so I’ve tried to stop. Out loud, at least. Okay – I googled. I am informed now. Carry on. I’m not proud of this, but I’m going to google Kate Bush now. 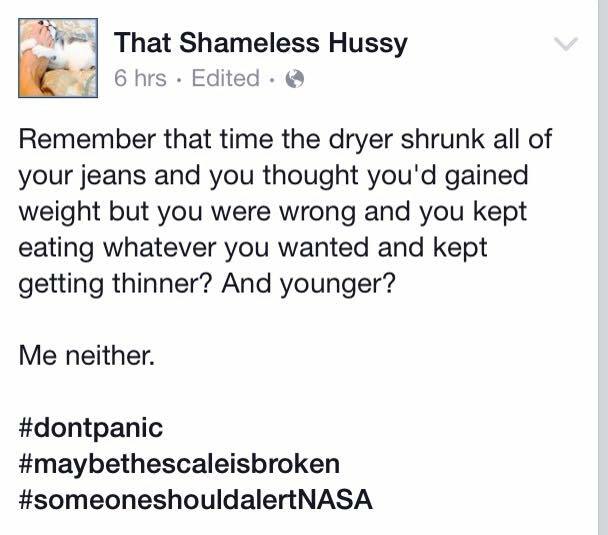 Scales are assholes. Here’s what I know. I have experienced weight fluctuation like any woman over 30, and I know when I feel the best is when my clothes fit me how I like them. Sometimes, I can get on the scale, and it says some low weight I know is not right because I had to push two butterball turkeys into the jeans I wore the day before. Sometimes I look, and it says some number that makes me both gasp and cry at the same time, but my jeans slide on with less real butter. Scales are lying bastards. That is all. I should read this post every day!